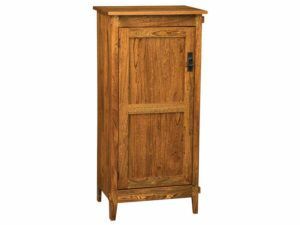 Add instant space to your kitchen or dining room with one of our beautifully-crafted Amish Jelly Cabinets and Cupboards. 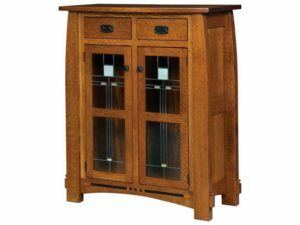 The finest Amish craftsmen in the Midwest build each one from solid regional hardwoods. So the wood jelly cabinet you chose will be incredibly sturdy. Also, we offer jelly cupboards in a wide variety of styles. Like Mission, Shaker and Traditional. As a result, you’re sure to find the perfect piece for your home. 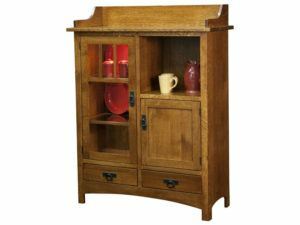 So browse our sizable online collection of wood jelly cupboards. Also, visit our ‘brick and mortar’ store in Shipshewana, Indiana. With a large selection of sizes and features, you’ll certainly find the cabinet or jelly cupboard of choice for your dining room or kitchen. From small, single door cupboards to large, four door pantries. Plus, you get to choose copper, glass or wood panel doors. What’s more, you can customize your cabinet to your heart’s content. For example, you can choose the wood specie, hardware and the stain/paint/dye. And we’ll work hand-in-hand with you to create an entirely unique cabinet to meet your personal taste.